The output of distributor Milestone Films is certainly not on the Criterion Collection scale, but over the past 12 years they’ve made some of the most important rediscoveries and preservation projects in international cinema. Among others, there’s I Am Cuba, Killer of Sheep, The Exiles and now Araya. It stuck out in cinema history as the co-winner of the Cannes International Critics’ Prize in 1959 along with Hiroshima Mon Amour. We all know the other film, but Araya? Never heard of it. While Alain Renais' film became an international success, Margot Benacerraf’s never received thorough distribution and thus got lost. With unerring simplicity, Benacerraf creates a marvelous portrait of Venezuela’s working class through the procedural workmanship of the nation's salineros – that is, men and women who mine salt from the earth by hand with only rudimentary tools to aid them. The stark black and white photography shot with feature film-worthy elegance creates a wholly cinematic feeling to this ‘documentary’. Benacerraf places her camera on dollies and cranes using all facets of the cinema language to showcase the immense scope of the work of the salineros. Loosely divided into chapters named after each specific subject, we get to see how every waking hour of everyone in the arid Araya region of northeastern Venezuela is dedicated to this menial process. First, there are the men who pull up the salt bricks from the shallow ocean floor, then the hand-powered boats that sail them over to the ‘refinery’ part of the shoreline. By refinery, I mean the men who chop up the bricks into mush from which the salt crystals are extracted. 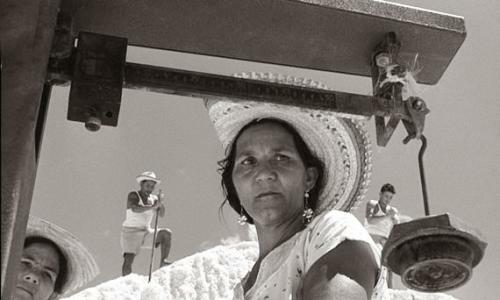 Watching the baskets of salt get transported on top of people’s heads, their feet tortured by the baking hot sun and corrosive salt beneath their souls, is eye-opening. The end of the process is signified by the magnificent image of a series of large salt pyramids dotting the landscape like buildings in a modern skyline. While the theme of man’s symbiotic connection to nature is clear, the anthropological procedural execution of this system is just as fascinating. Like worker bees making honey or ants organized in their colonies, these people have been doing this job this exact same way for 450 years. From the system of payment to the calculation by hand of each salt ration and the solitary woman whose sole job is to make clay pots by hand, everyone has a place in this society. But with such dependence on one industry so closely tied to the environment, we know by proxy the volatility of this lifestyle. And this was 1959, before ‘the environment’ was even an issue. But Benacerraf has the foresight to know the shortcomings. Towards the end of the film, she cleverly intercuts a sequence of salt extraction by method of machinery, the speed and efficiency of which tells us exactly what will happen to these people. This tone of quiet melancholy comes across so elegantly when combined with the lush visuals and poetic omniscient voiceover. Looking back all these years, it’s a shame we’ve only started to talk about this film now. As I was watching it, it unequivocally felt like a classic – wholly accessible, mainstream and compelling. Someone missed the boat in 1959, but better late than never. Araya is available on Special Edition DVD from Milestone Films.